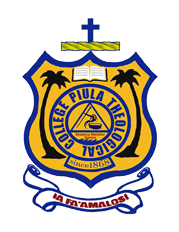 Piula Theological College is the Samoa Methodist Church’s training institution established in 1868 at Lufilufi on the north coast of Upolu island, to train generations of Pastors and Ministers for the work of the Church at home and abroad. The College was initially setup in 1859 at Satupaitea on the south coast of Savaii island. The Methodist Mission in Samoa purchased the land at the Methodist leaning district, Anoama’a, and later named its training center Piula Theological College. The name Piula is a transliteration of the Biblical Hebrew name Beulah which means married (to the Lord). In Samoa, the Methodist religion is referred to as Lotu Tonga through the early initial contact with converts and the church’s mission in Tongafrom late 18th to early 19th century. The decision to set up the training institution came about from an annual church meeting held on Manono Island, on 21 September 1859. Manono was the place where the first Wesleyan missionary, Peter Turner, had set foot on, and was developed to be one of the stronghold of the Methodist mission in Samoa. The College includes the recently renovated historical Piula Chapel, a memorial to the work of Rev. E. G. Neil and the Samoan builders who carried out its creation between 1911 and 1921. Other icons of the College compound include the Multi-purpose Hall with a capacity of 1000 seats, a large open play ground for Samoan cricket and other open fielded sports, a Pre-school to nurture the future generations of the Church, the Peter Turner’s Memorial Library, the canteen which caters for the local needs of the College, the classrooms and of course the residences for the lecturers and students. At the side of the chapel are steps leading down to the sea where Fatumea, the famous Piula Cave Pool is situated, a popular freshwater swimming hole for locals and visitors. We glance into the next five years with hope and confidence of becoming one of the best Theological Colleges in the region that provide quality theological learning, where academic excellence is carefully woven with spiritual quality and pastoral discipline. Piula’s 150th Anniversary is in that next three years, where it is anticipated to be an occasion to realise infrastructure improvement that is compatible with a higher learning institution, and the modest transformation of some of its conventional essentials to be acquainted with the challenges of the present and into the future. Piula is a holistic community of learning and leadership training based on its Methodist heritage, to serve the Christian Church and the global community with love and compassion. Piula provides ministers and wives of faith, who dedicate themselves to be agents of change in the lives of the people of God, and continue to interpret this faith in the life and witness of the Church in Oceania, through a successful collaboration of academic competence, Wesleyan traditions, spiritual eminence, and Samoan cultural values. Piula is accountable to the Methodist Church in Samoa. As an institution that was set up to provide theological training for the ministers of the Church, it is mandated to train ministers and leaders according to the traditions, theology, and discipline of the Methodist Church in Samoa, with due respect of our cultural values, and other denominational and religious traditions. Piula is liable to update the Conference with the fruits of its calling, annually. Teaching and learning, worship and leadership training in Piula is based on the Apostle and Nicene Creeds, as well as the founding statements of faith as prescribed by the Constitution of the Methodist Church in Samoa.